You know how simple recipes are sometimes the best? And how take-out Chinese food can sometimes be exactly what you want, no matter how inauthentic it is? Well, this is definitely one of those recipes. And I’ll be back on Thursday with something more exciting. 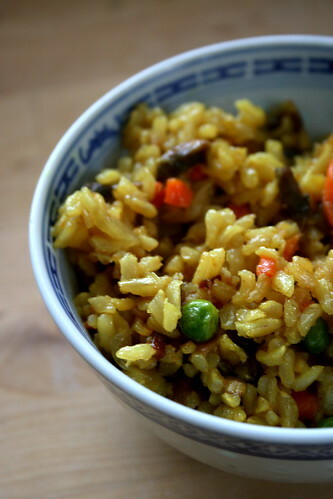 But until then, enjoy this simple yet oh-so-satisfying gluten-free vegan fried rice. It beats out whatever your local take-out place can give you, but beware, you might end up eating half the recipe by yourself in one sitting. You never know. In a wok over medium heat, heat the vegetable oil and saute the onion and carrots for 5-6 minutes, until the onions are translucent. Add the garlic, saute for 1 minute more. Add the peas and mushrooms (and any other vegetables you’d like to add) and cook for 5 minutes more, until the mushrooms are cooked. Add the Braggs (more or less to taste–it is rather salty) and saute for 1-2 minutes until everything is well mixed and heated through. Serve as is or with some kind of stir-fry. Looks delicious! I could probably eat all of that by myself, I love fried rice. this looks wonderful! and perfect because i’ve been in a craving chinese food sort of mood these last few days. my hubby just walked by and i said, “wanno know what’s for dinner tonight” and i pointed to the rice pic. My mom used to make fried rice for us as kids all the time. It was a definite fave and I think you may have just inspired it back into my life. Watch the blog for me version soon! This looks delicious! I love fried rice. I must admit, I’ve never made fried rice. Noodle stir fries? Plenty, millions even. But never rice. Your big bowl of carb-tastic goodness is imploring me to rectify this situation, asap. It looks so delicious! Can you believe I’ve never made fried rice? Crazy nonsense, no doubt!! This recipe looks wonderful. Thank you for sharing. I crave fried rice from time to time; yours look fabulous, Jes. One question: do you really cook 3 cups of rice in 4 1/2 cups of water? I always do a 1:2 ratio. I imagine it would come out chewier with less water, which could be a good thing. you know what? I constantly forget to make fried rice, and I’m constantly forgetting just how GOOD it is – this makes me hungry! Since going gluten-free, fried rice has definitely become one of my weeknight staples. So flexible, and always so tasty! Mm, comfort food. This looks fantastic. I especially love that it’s made with foods I usually keep stocked and on hand, definitely starring this recipe! dan is going to love you the most, Jes! he looooooves fried rice – everytime we order take out that’s what he always gets. – “fried rice, no egg, add tofu.” i’m going to HAVE to make your fried rice for him super soon – i might even bake some tofu and just season it with sea salt ‘n pepper to keep it simple so it will pair well with your rice. the technique that you have for the rice has me intrigued – i’ve never thought to cook it for just a bit and then dry it out. the one time i actually attempted fried rice the rice itself was mushy and absorbed too much oil, so i’m excited to try your technique! thanks, Jes! You’ve read my mind! Just the other day I was saying I wanted to make some fried rice and now I’ve got a great recipe for it. Thank you, it looks delicious. Yum. I love fried rice. Every time I have rice with a meal, I always make extra so I can make fried rice with the leftovers. I like to add tofu to mine, and sometimes garlic and ginger. I also do the same with leftover quinoa. So good. I am so excited they are growing! It’s so petty, but my genetic lineage seriously suggested that my physique should look otherwise. I can’t wait to buy those damn bras. And thank you! I’ve pretty much freaked out a handful of vegans with how real it looks. Holy cluck…hah. You’re silly. Fried rice was one of the first things I taught myself to cook. I love how you can just throw in whatever veggies you have on hand and it always comes out good.